East Africa is world famous for its spectacular wildlife and panoramas: the annual migration of two million zebras and wildebeest in the Serengeti and Maasai Mara Game Reser﻿ves; the breathtaking natural wonder of the gigantic Ngorongoro Crater, the largest unbroken volcanic caldera in the world, teeming with wildlife in its center; the majestic snow-capped Mount Kilimanjaro. The continent’s unique, dazzling wildlife and landscapes are precious natural resources, and add much to the mystique of Africa. East Africa, in particular Kenya, has long enjoyed tremendous worldwide support for the conservation of its distinctive terrestrial fauna. As a result, the region’s wildlife is well protected. The game reserves earn significant revenue, and the local populations take pride in, and generally support, the conservation of this wildlife. However, East Africa’s equally impressive coastal/marine flora and fauna is much less understood or appreciated by both locals and foreigners. In fact, much of the marine biodiversity remains unknown to science, as new species are continually being discovered. Contrary to what many people imagine, the ocean is not one giant homogeneous ecosystem. Indeed, the ocean contains a multitude of ecosystems, many analogous to ones on land. These diverse ecosystems include mangroves (“forests”), sea grass beds (“savannahs” and “prairies”), coral reefs, estuaries, deep-ocean trenches, canyons, mountain ranges, and hydrothermal vents. Mangrove trees, sea grasses, and coral reefs are all quite productive, comparing well to tropical rainforests and grasslands. These marine environments create an overwhelming diversity of life forms comparable to those of terrestrial environments. Mola mola, one of the world's largest bony fish. 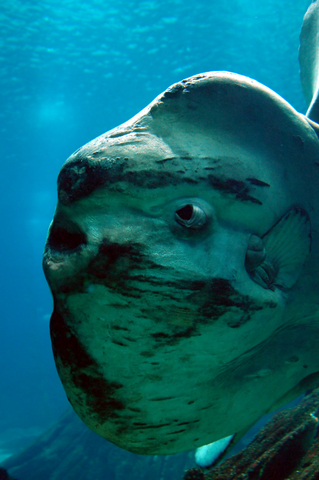 The variety of East Africa’s marine life is incredible, consisting of delicate seahorses, razor- and pipe-fish, dazzling angel- and butterfly-fish, mudskippers, and the giants of the open sea—sharks, tuna, black marlin, and the odd-looking sunfish, Mola mola, which is the world’s largest and heaviest bony fish, known to reach weights over a ton. 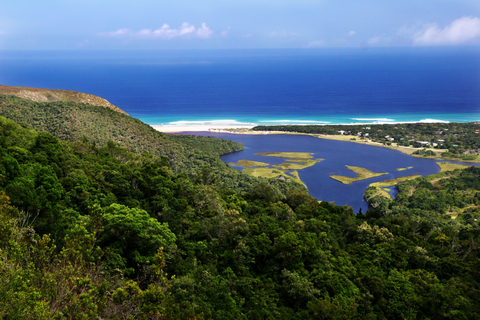 The inshore waters support more than 11,000 known species of plants and animals, an estimated 10% to 15% of which are thought to be endemic to this ecoregion. The Indo-Pacific bioregion (stretching from eastern Africa to the eastern Pacific Ocean islands of Hawaii and Polynesia) hosts 91.9% of the world’s coral reefs. These are the largest structures built by any living organisms, humans included. The kaleidoscope of colors and shapes that form them is a living natural wonder, with its spectacular array of fish, corals, and other invertebrates. Fringing coral reefs (the most common type seen along the shores of continental landmasses) stretch 100 km or more in many places in East Africa, lining most of the coastline from Somalia to Mozambique. 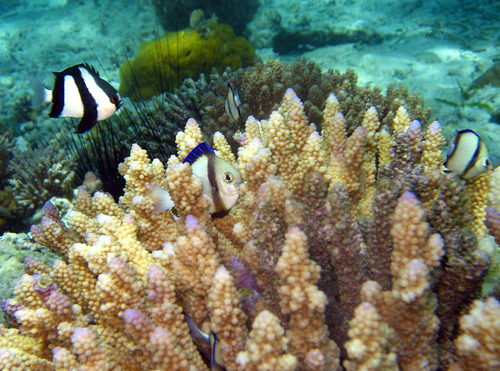 The coral reefs’ extraordinary biodiversity is sustained by the complexity of this coastline and by the vast range of habitats found in the region. In addition to supporting a cornucopia of life forms, the ocean has played an intimate role in maritime history of East Africa. East Africa's coastline has had a long history of human interaction, from the Neolithic period to the present. The ancient Indian Ocean trading network expanded to the East African region as early as the first century BC. The earliest mention of maritime trade with Arabia and Persia is found in the Periplus of the Erythrean Sea, a mid-first century CE Greek description of trading in the Indian Ocean. In later centuries, explorers and traders from as far away as China arrived on the shores of the East African coast. 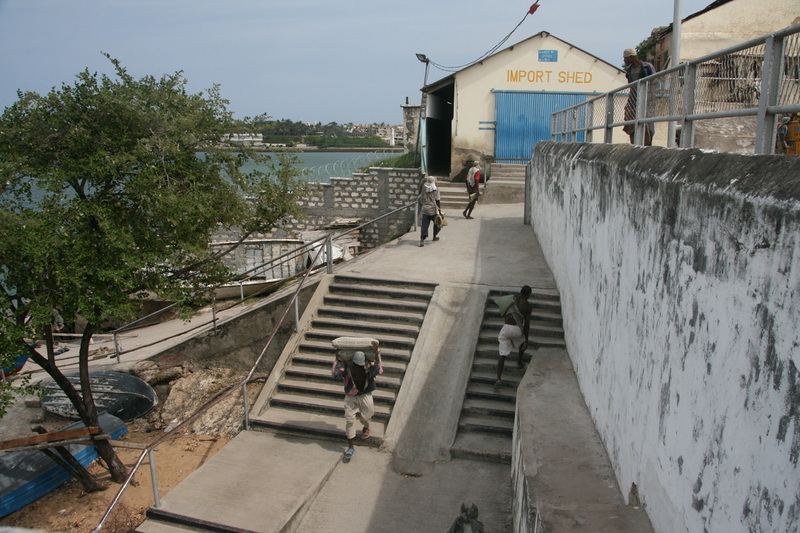 Perhaps no one feature demonstrates the significance of this trade than Fort Jesus, located in the city of Mombasa on the east coast of Kenya. Mombasa, one of the oldest port cities on the coast of East Africa, occupies a strategic location in the middle of the western Indian Ocean. 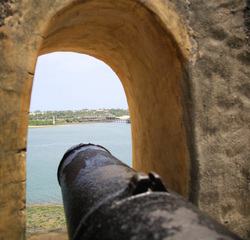 One of the many canons positioned in Fort Jesus. 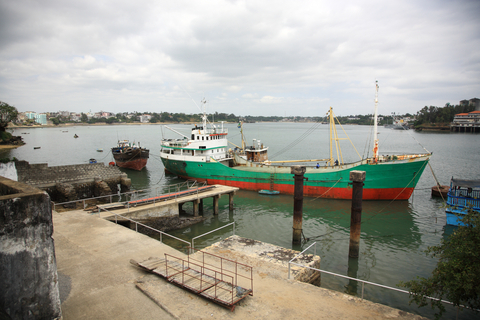 The Mombasa port was the major trade harbor used by traders from Asia and Arabia. Mombasa, therefore, attracted the attention of powers that wanted a share of the Indian Ocean trade, and the Portuguese were no exception. 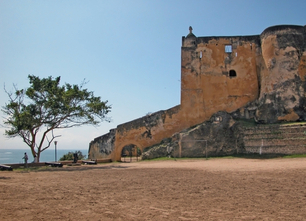 To guard their own trade interests, control the encroachment of competing hostile powers, and protect the trade routes to Asia, the Portuguese constructed a fort, Fort Jesus. The Portuguese built Fort Jesus in 1593 to guard the entrance to Mombasa Dhow Harbor and to protect their trading interests on the coast of East Africa. The site chosen was a coral ridge at the entrance to the harbor. By the 15th century, the entire East African coast had become quite prosperous. However, trade during this period (known as the Golden Age of Swahili civilization) did more than just improve the local economy. It created a whole new civilization. Over the last two thousand years, this trade has been the channel through which cultures have fused to produce the coastal Swahili community. Although the locals pursued other occupations (primarily agriculture), it was their maritime activities that gave them their prosperity and their raison-d’être. 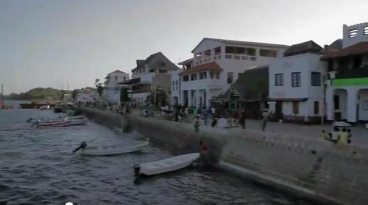 Old Town Harbor, Mombasa Kenya. East African Coastal Cities, such as Lamu, Kenya offer a step back into a medieval past where dhows are the main form of transportation.